Would then, wouldn't principal send both of you and Baldi to detention? HAH! 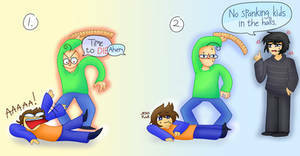 That's what you get for chasing us all over the place Baldi! that was hillarious, this made me thinking Gotta Sweep bursting out the window, still shoutting "GOTTA SWEEP SWEEP SWEEP!!!" I love this! Would it be ok for me to dub it? I'll be sure to credit you in the video! 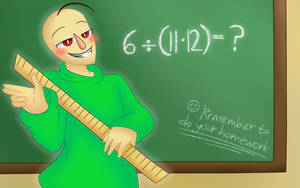 Wait have you noticed something: Baldi in the games states that this is HIS school, and yet he's NOT the principal? a child could say that â€œthis is my houseâ€� when itâ€™s legally his parents house. I imagine it like that. Just my two cents though! Hi! I love your comics! Would it be ok for me to dub it? I'll be sure to credit you in the video! 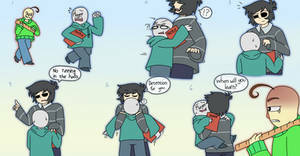 No wonder why Baldi teleports in the halls. I am now in love with this game.